Veteran sponsors are donating a “free” entry to a deserving veteran from the community. 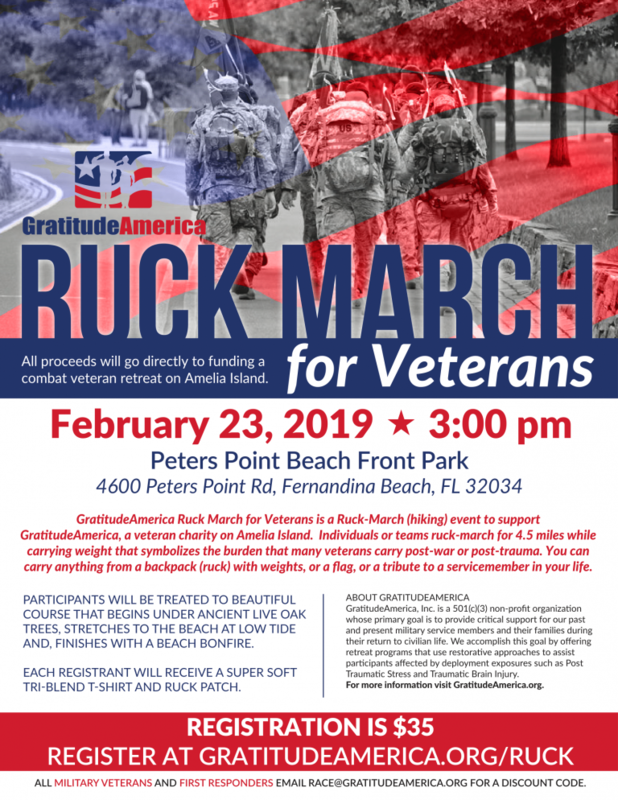 You may add your contact information at the below link indicating your interest in receiving a sponsored “free” entry to the Ruck March for Veterans. Filling out this application does not guarantee a free entry. Notification will be made by February 20, 2019. If you do not hear by February 20, 2019 you can assume you have not received a sponsorship. All veterans receive a discounted entry to the event. GratitudeAmerica Ruck March for Veterans is a Ruck-March (hiking) event to support GratitudeAmerica, a veteran charity on Amelia Island.Individuals or teams ruck-march for 4.5 miles while carrying weight that symbolizes the burden that many veterans carry post-war or post-trauma.You can carry anything from a backpack (ruck) with weights, or a flag, or a tribute to a service member in your life. All proceeds will go directly to funding a combat veteran retreat on Amelia Island. What is “rucking”? Hiking is rucking in the mountains; urban hiking is simply called rucking. How much weight am I required to carry in my ruck? The weight you choose to carry is dependent on the person carrying it. Don’t over do it because a very heavy ruck at the beginning, becomes unbearable at the end. Be safety conscious, always keep safety in mind. What can I use as weight in my backpack or rucksack? Bricks, weights, metal plates, rocks, sand bags, etc. Can I carry an American Flag or service flag during the ruck march? Of course. We highly recommend carrying an American Flag during the ruck-march. What type of support will be provided at rest stops? At the rest stops, volunteers will provide water, PowerAide and some snacks. No. This is a fundraiser to raise money for veteran retreats. We want to keep our service members in mind as we ruck like they do. No. Wear what is comfortable for you. You should train in them to prepare for the event. If you choose to wear boots it is advised that you pack a pair of sneakers in your ruck in case the boots become too uncomfortable. Is there a minimum weight required for my rucksack? No. Carry what you are capable of. You can carry as much or little weight as you like. Do I have to carry a rucksack? It is preferred that participants carry a backpack or weight that symbolizes the burden that many veterans carry post-war or post-trauma. But if you medically can’t, or don’t choose to; you won’t be pressured to do so. What charity do the donations assist and where do donations go? All donations and registration fees will go to GratitudeAmerica so we may fund a upcoming veteran retreat. GratitudeAmerica is a 501 (c)(3) non-profit organization. GORUCK is the official gear sponsor of the GratitudeAmerica Ruck March for Veterans. Visit GORUCK.com to see their high quality rucking gear.